Ok, this post is a wee bit off the track, so bear with us. Maybe it is just us, or are the ads these days losing out on connecting with us? The readiest jingles that comes to mind are the ones in the early 90’s. One of the all time favorite surely was; well, is Sundrop’s Healthy Oil for Healthy people. It’s crisp, to the point, and best part is, no fear mongering. No one is going to die if you don’t buy, but boy oh boy would you really want to miss out on that perfectly browned crispy cutlet, or the stuffed tomato deep fried?? There’s so much energy and positivity vibing off the boy that anyone who’s seen it would still feel it. And the scene where the puri avalanches on him? Stroke of genius! 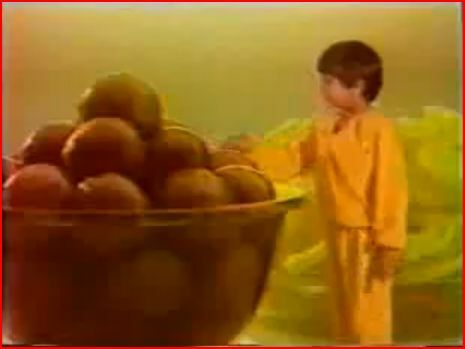 We think it's every kid's dream to have a bowl of gulab jamuns as big as him. And all of this in 30 seconds. To show food being integral to a relationship when it’s only in the last 5 seconds that the mother and son are even shown together. Why are we doing a biopsy of this lost classic? Because there’s another ad which steals your heart much the same way. Something about this ad makes you feel like it’s the Sundrop mom and kid 2 decades later: The table full of goodies, the memory of the mischievousness. But the clincher is the scene with everyone digging in because there’s always enough and never enough when food’s been made with so much love. Why we love these two ads? Because at the end of the day, Good food is prepared only with with a bit of pain, passion and infinite care about the person who’s going to eat it. That’s the secret ingredient! Guess that’s why mom’s and grandmom’s food always tastes the best! *Bear with the marketing jargon!